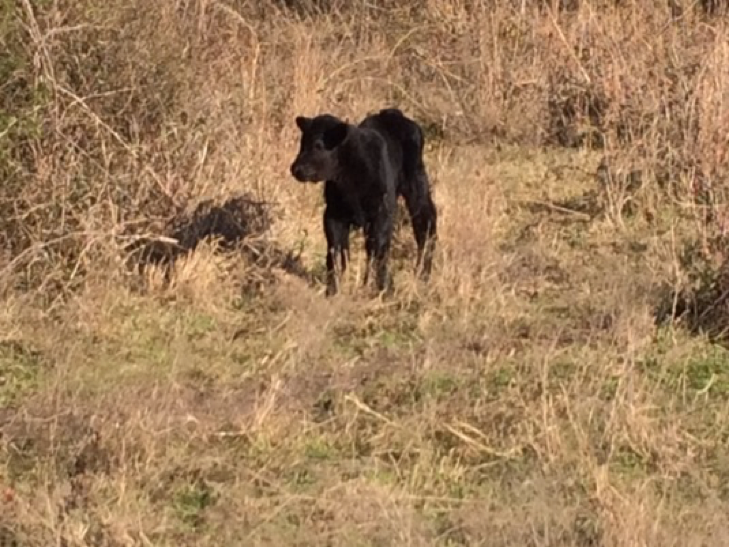 We have 2 new additions at Jolie Vue, our vigorous black Angus calf and Chicory, our black Labrador puppy. Chicory will be in school for the next few months while the calf will be staying close to Mom. Are they cute or what?! In the meantime, we have hit a dry spot since the first of the year with no sign of relief in the near term. This complicates our winter pasture rotation since the grasses do not recover quickly enough. We are about to hit that “nowhere to go” point so we’ll have to revert to stored grass (aka, hay) for a while. Nothing wrong with that except the additional cost to us and the fact that the creatures do not appreciate it like growing grass. Happy critters are healthy critters, and nothing makes them happier than grazing their natural salad bar. Hay is sort of like eating the leftovers from last night’s dinner – it sustains, but doesn’t impart the same sense of satisfaction as a fresh meal. The pigs are an easier story as their coming rotations are high in oat and rye grass and they eat such a wide variety of foods so do not eat it down as quickly as our herbivorians who depend on grass exclusively. And the mild to cold weather fits their body and temperament perfectly. So the piggers have big grins on their snouts all day long. But it’s not just cows and pigs that are enjoying the landscape at JVF. We are awash in the wild creatures. The Deer Family is growing larger, 8 in number now while it started out at 5 many months ago. Feral piggies run in a pack of 12 (as big a nuisance as they can be, they are darn cute to watch). Rabbits, mainly cottontails but also Jacks, are everywhere, as are raccoons, opossum, field mice and skunks. Among the flyers, we see terns, bluebirds, cardinals, mockingbirds, dove and sparrows (none of whom can figure out if we’re on the verge of spring or still in winter). Among the flying predators, we have all manner of hawks and herons cruising the pastures and ponds, waiting for a mouse or a fish to get careless. A feral cat has adopted us too, a sign that the mouse population is booming. In short, the wild ones have declared JVF a safe harbor and bountiful place to live. It’s a good sign when those that depend on intuition and instinct declare your little patch of earth a good place to eat and raise their children. Each of these creatures make their contribution to the health of our farm. JVF is now a balanced ecosystem. We feel like we are in harmony. And you, the CSA member, are perhaps the biggest part of that. None of this is possible without your support of the farm. We thank you for coming with us in this food and nature adventure. We’ll never get rich farming – we’re just trying to not get poor! The farm makes us all healthier humans; that is the payoff.